William James, the 19th century American philosopher once said, “As long as there are postmen life will have zest” and I completely agree. It’s not that most postmen have such good looks and winning personalities. It’s that they are the ones who deposit delightful treats in my mailbox. Letters! Big ones, small ones, letters in all colors of the rainbow, with exotic postage stamps and cute little stickers. Ah! The pleasure of a letter addressed just to me. There’s practically a radiance to it. The other day I ran across a line by William Wordsworth. He wrote, “My heart leaps up when I behold a rainbow in the sky,” – a nicely turned phrase, but for me, it’s letters in my mailbox that make my heart skip a beat, leap up and dance for joy. It’s a sad day when my mail consists of nothing but catalogs, bills and material addressed ‘occupant’. Luckily, such days are rare for me because when you give (and I give) good things come back to you. 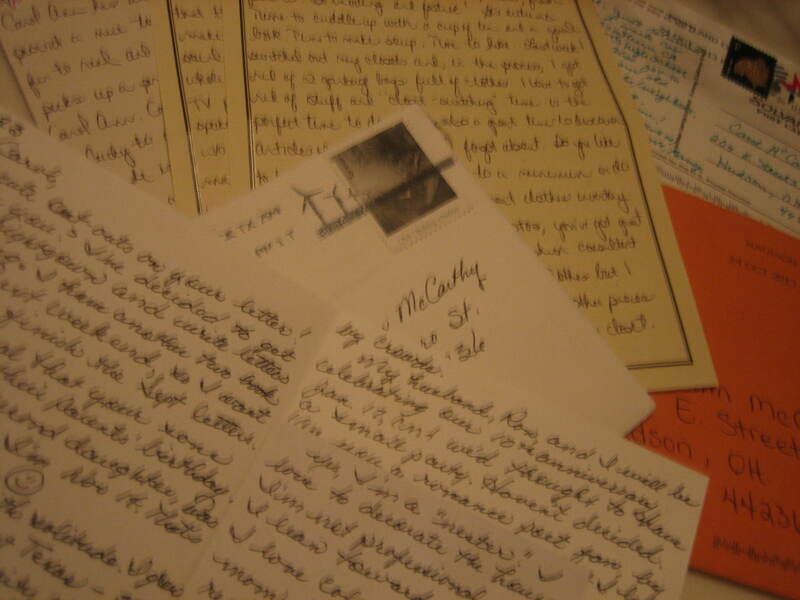 I write a lot of letters so I receive a lot of letters in return. How many letters do you receive everyday? 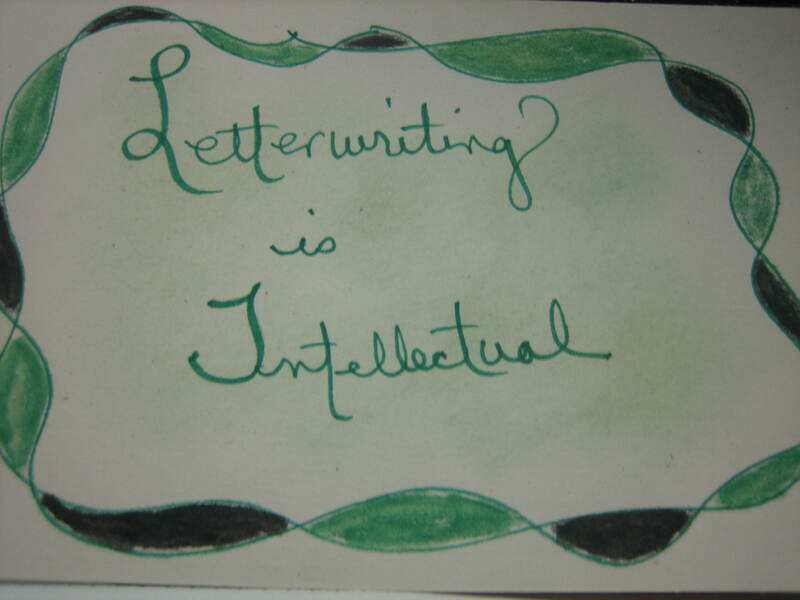 How many letters do you write every day? There’s a correlation, you know. Letters are wonderful, a physical art form and a great venue for social interaction. But besides that, when we write and receive letters we’re enriching our intellectual life for ideas expressed and discussed stimulate the mind and offer us food for thought. In letter conversations we can explore any number of subjects and in that exploration we can inspire others and be inspired ourselves. We can teach and we can learn. 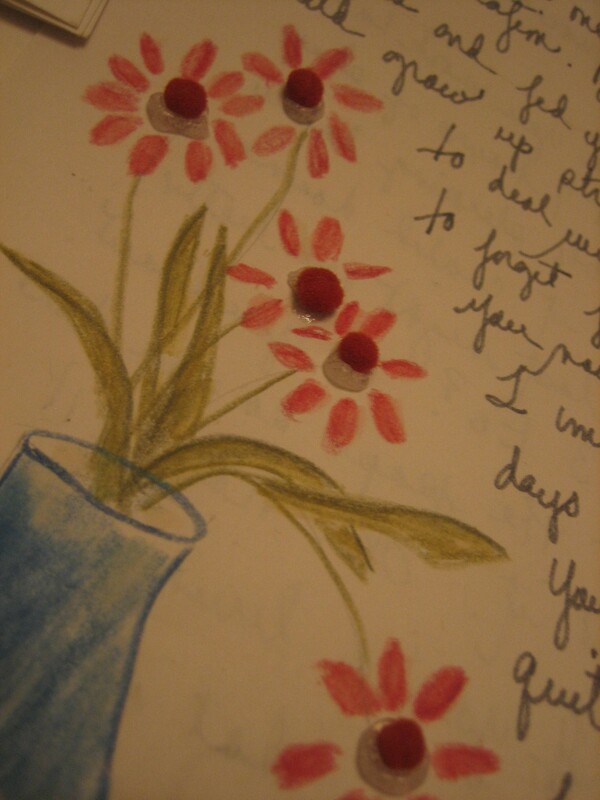 Many of my letter friends delight me by sharing the passions dear to their hearts. Some of their passions are my passions too and discussing these favorite subjects is always great fun. But I’m equally delighted to hear about whatever makes people light up and come to life. Life is what it’s all about and letters are a wonderful vehicle in which to reflect upon the life we lead. Ah life! We only have one life to lead, but as we meet and get to know a variety of people we can experience, like second hand smoke, a variety of passions. 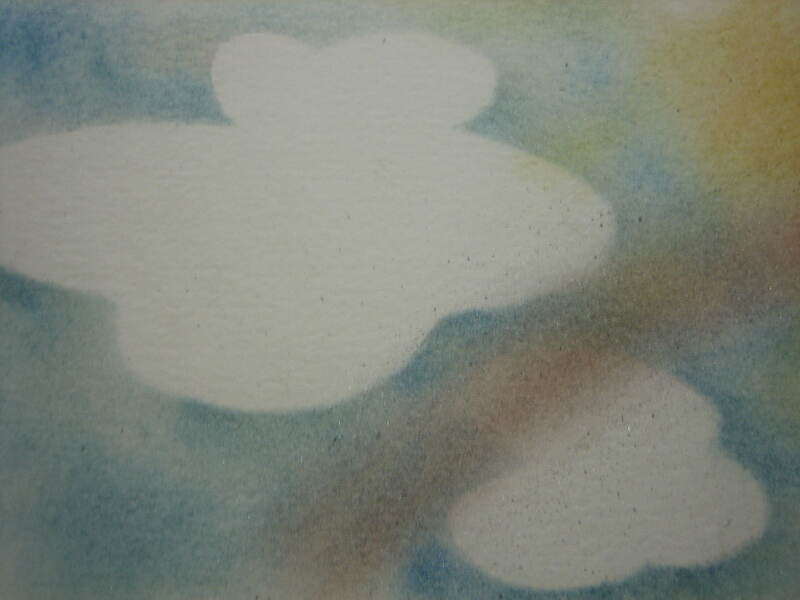 Even if we don’t share these passions we are broadened by our awareness of them. 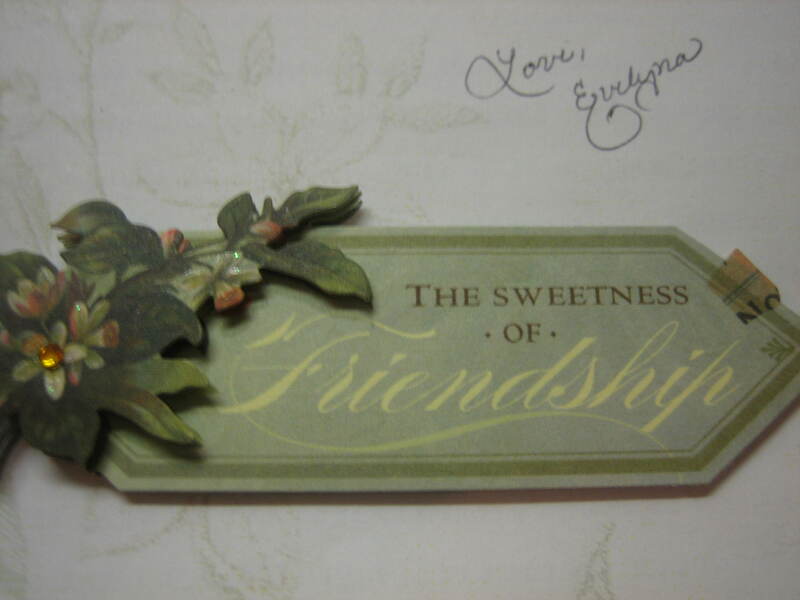 My pen friend, Evelyna, not only shares my enthusiasm for The Art of Letter Writing, but she also shares my passion for The Art of Living. Evelyna “walks in the beauty way” as the Navajo would say. Evelyna’ celebrated her love of lavender by creating this photograph for her letter paper. 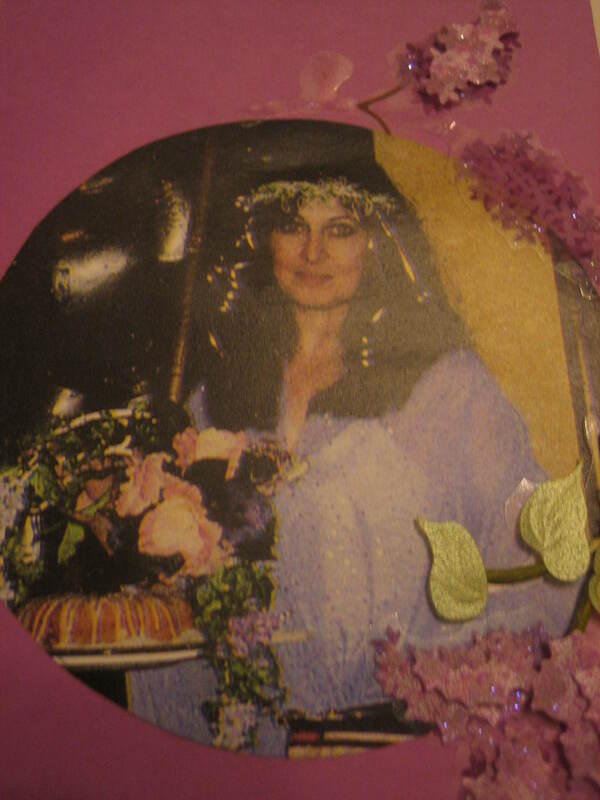 She decorated lavender paper with a portrait of herself wearing a lavender gown. She added a garland of flowers and ribbons in her hair and posed holding a basket of flowers and baked goods. What fun she must have had creating this cover photo. You might think only 19th century ladies would be seen this way, but Evelyna is a 21st century Romantic. Romantics might be rare these days, but they do exist. I know because I am a Romantic too. 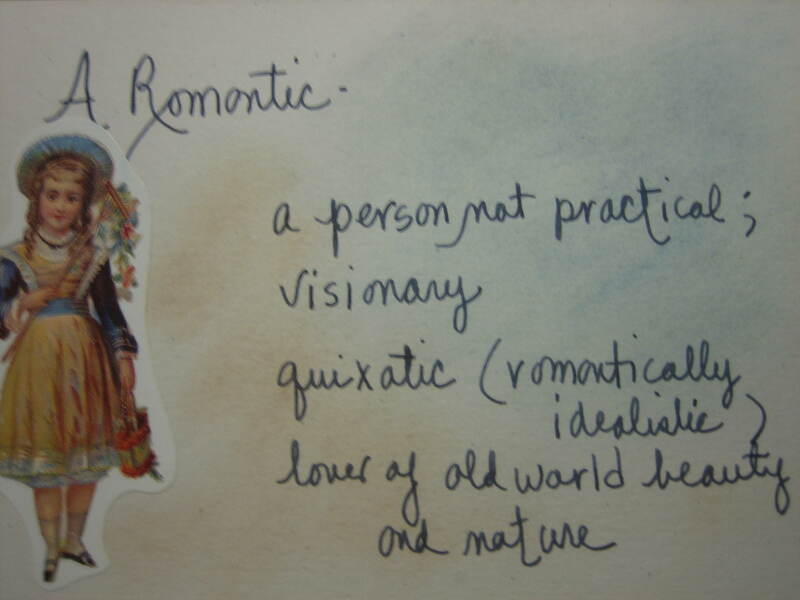 Do you have any Romanticism in your blood? If you do, you would love a pen friend like Evelyna. Not only are her letters beautiful, but because they focus on the beauty of life they are very positive and uplifting. Also, like any good letter writer, Evelyna makes a point of showing her appreciation for her letter friends. Finding one of her letters in my mailbox always has the power to put a smile on my face and a bounce in my step. “…Do you know what I most enjoy about your letters? Reading them seems to give me some moments of quiet respite from my interminable deadlines. Although you are every bit as busy and productive as I am, your days and activities seem to move at a much more relaxed and leisurely pace. You seem to have more freedom within your schedule to do things you love when you want to, which seems like such a luxury to me. 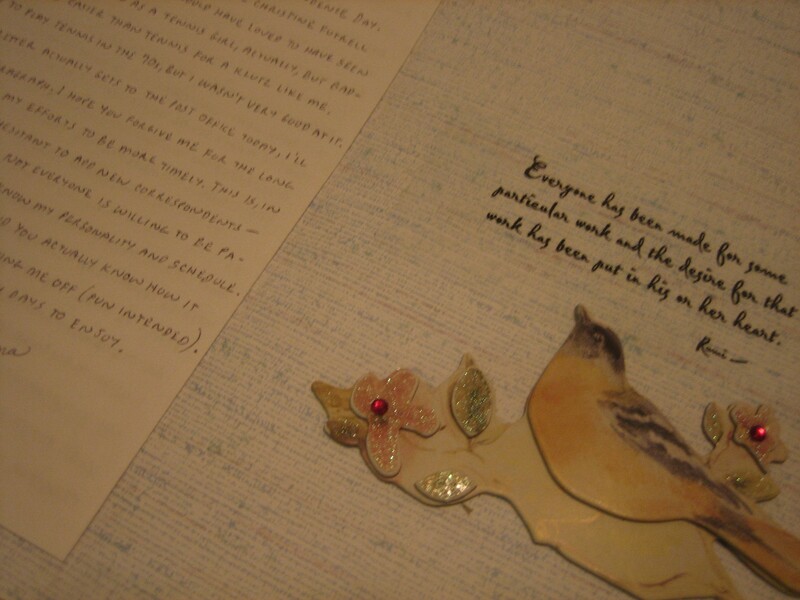 While reading your letters, I find a sense of slowing down within myself, like a 78 record being played on 33 rpm. This is good for me. Of course, it also helps that when I see a letter from you, I don’t just tear it open and start reading it. I set it aside while brewing a cup of Earl Grey tea in a porcelain pot. I then sit down in another room or in my garden, open the envelope with my art noveau letter opener, then revel in what you’ve written while sipping and dreaming and reading. You see, once again, it’s all about creating a ritual, if only for five minutes. It’s up to us to find moments of peace and beauty in our lives, and if they aren’t readily available, we must create them for ourselves. On that note I will close with a word of appreciation for our friendship and a wish for moments of beauty throughout your day. p.s. from CarolAnn Do you now understand why William James and I believe as long as there are postmen life will have zest? Having a pen friend, a kindred spirit, helps us focus on, and be true to, the way we want to live. Articulating our ideas to each other helps us define and refine those ideas. Sharing offers support and encouragement. Whether we share information on our favorite subjects or discuss and describe favorite ideas, the writing, the reading, the musing over words contained in letters, stimulates our thinking and as a result, enriches our intellectual life. 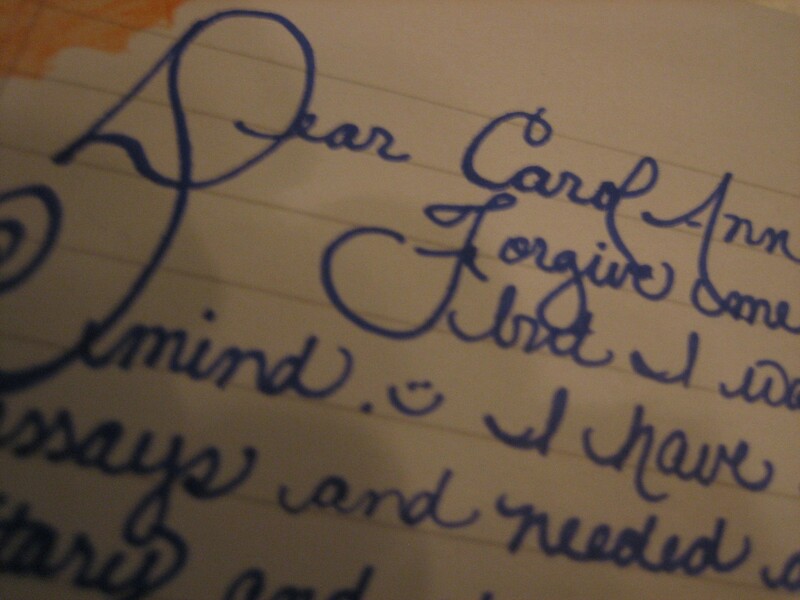 What subject would you love to discuss in letters? There’s probably someone out there with the same desire. What are you waiting for? Find that person. Join The Letter Exchange and start sharing. 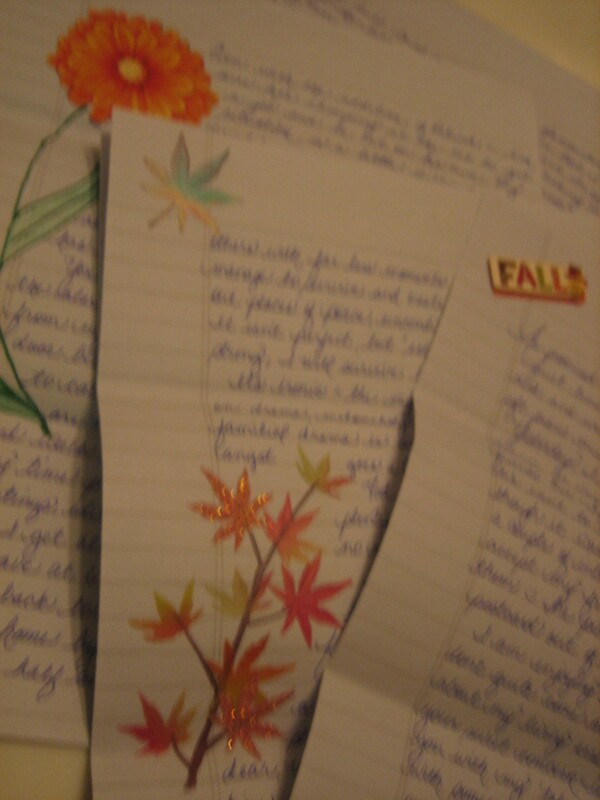 Evelyna is indeed a lovely lady and I am enjoying her insightful letters. I have not received any of her artwork yet but know I will someday. Yay! *claps* You received my letter! 😉 Can’t wait to her back, friend of my soul. Gwen, In future posts I will be writing about intellectual snippets contained in the letters I receive. Don’t be surprised if you find yourself reading something you once shared with me in one of your lovely letters. Sharing doubles the joy. Stay tuned. Michelle, Your last letter was absolutely beautiful, deserving of a post all to itself; and that just might happen!